After E3's fall, one green developer was telling me much he missed the show. I asked if he'd ever been invited to Sony's party, the legendary events with big bands, sometimes held in sports stadiums. The young developer admitted he'd never been admitted to the Sony party, but that E3 was still totally awesome even if there were parties he couldn't get into. E3 presented a chance to tangibly participate, regardless of who or what you were in the industry. If E3 during the day was about videogames, E3 at night was about wafer-thin bottled blondes with clipboards who were all that stood between eager geeks and free alcohol. PR people held great power at what was ostensibly a press event. Everyone had a good E3 story to trade. 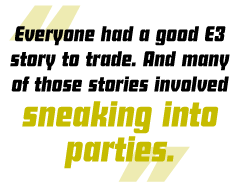 And many of those stories involved sneaking into parties, with methods that became evermore high-tech, bordering on forgery and counterfeiting. Probably the best tale was about sneaking Will Wright into a party through the venue's kitchen. The other rite of passage was a pilgrimage to the Game Developers Conference in its spiritual home, San Jose, California. Each night during the conference, developers would gather in the lobby of the Fairmont hotel, buy each other drinks and further the game industry simply by talking. It was fashionable to claim that downtown San Jose was a deserted, strange ghost town, like the Disneyland version of a small Californian city, complete with trolley tracks but simply nothing to do. In truth, San Jose was like a bowl that filled up with game developers for one glorious week each year. My favorite memory from that final GDC in San Jose was being thrown out of conference director Jamil Moledina's suite party. It started out innocently enough. You see, I was looking for the Gamespot 10th anniversary party. It was to be in the presidential suite, on the top floor of the Fairmont, but the room was dark and silent. Rounding the corner toward the elevator, I heard what was obviously an event in an adjacent suite. "Perhaps it's in here," I thought to myself. I knocked on the door. It opened a crack. An eye peered at me. It stared at my conference badge. A voice asked me a question: the name of the editor-in-chief of the publication printed on my nametag. I answered instantly, amending my answer to include that editor's middle name. The door opened, I was ushered inside and I exchanged business cards. The gatekeeper turned out to be one of the industry's top public relations people. How could I know, then, how it would all end? I grabbed a drink and wandered over to chat with EA's Doug Church. In one corner, the then-phenomenal Guitar Hero was on. I crossed the room to introduce myself to Moledina, and because I cared about such things, began to ask a series of questions, tantamount to "So what's it like being a conference director?" Moledina paused, looked at the ceiling, and began, "I don't know how to put this," and instantly I thought that this would be the most profound comment on the nature of conferences, as they related to life and the universe, "but I'm going to have to ask you to leave," he said. It ended pretty much visually from there on out. It seems that one time, years ago, a reporter from the Los Angeles Times was admitted to the suite party and later wrote about the amount of drug use in the game industry. And now, each successive GDC director must uphold the tradition of disallowing media, because they might be jackals.